A pictorial history of jerseys of the NHL, WHA, IHL and college leagues. A series of hockey coaching practice guides. Designed to assist hockey coaches in providing structured hockey practices maximizing ice utilization and skill repetition. A historical hockey site dedicated to BeeHive hockey photos, which are photos of NHL hockey players who played between 1934 and 1967. A hockey school for elite and recreational hockey players, also has a father/son camp. Hockey fan writes about issues relating to the National Hockey League (NHL) and the game in general. Learn about Russian hockey players, past and present, as well as the Soviet Unions and Russias international success in hockey. A summer hockey tournament for elite 'AAA' hockey teams. Offers international hockey tournaments and hockey schools. Information on its trained staff, qualifications, facilities, and locations. Hockey publication featuring youth and amateur hockey news and information from Minnesota and the upper midwest of the United States. Offering a morning ice hockey program to men and women 18+ in the Boston area. Year round ice hockey leagues. Always accepting new registrations at all levels. Online version of quarterly magazine. News about hockey in the state: mens and womens, from youth hockey to professional level. Hockey camp for professional (drafted NHL), elite and advanced players, hockey tours with international games and tournaments in Central Europe. Year round clinics and camps utilizing North American and European power skating, puck handling, and hockey drills. Unofficial UNO Maverick Hockey site with updated news, schedules, scores, rosters, and links to all the Division I college hockey and Junior A teams in the USA and Canada. The Quesnel Hockey Academdy is a partnership of Hockey Canada Skills Academy, School District 28 and the Quesnel and District Minor Hockey Association. Teaches hockey skills. Located in Winkler, Manitoba, Canada. StykWorks Female Hockey Camp is open to all female hockey players who aspire to improve their hockey skills and have fun. Site includes schedules and information as well as a registration form. At the Sport International Hockey Academy, our concept is Total Hockey and the accent is on learning through our highly qualified international staff and advanced techniques. We have tips on what to look for when deciding on a summer hockey camp. Multimedia, hockey tips, links, CVC hockey news, contacts, coaching staff, roster, schedule, team photo album, league standings, coachs corner, and weather forecast. Promotes hockey in Queensland and managed the State Hockey Centre. News, draws, results, associations, teams and coaching. If the business hours of Drop the Pucks in may vary on holidays like Valentine’s Day, Washington’s Birthday, St. Patrick’s Day, Easter, Easter eve and Mother’s day. We display standard opening hours and price ranges in our profile site. We recommend to check out dropthepucks.com/ for further information. 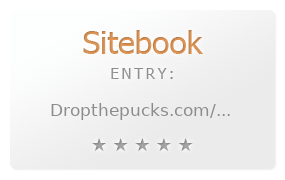 You can also search for Alternatives for dropthepucks.com/ on our Review Site Sitebook.org All trademarks are the property of their respective owners. If we should delete this entry, please send us a short E-Mail.